The Alabama lease termination letter is a document that is used for month to month leaseholders who would like to terminate their rental contract. Either party, landlord or tenant, may use this form as long as it is sent to the other party with at least thirty (30) days’ notice before the next payment date. The letter is recommended to be sent through via Certified Letter, private courier service, or by in-person to either the landlord or tenant. Whatever option is selected it is a good idea to have the other party sign the document to acknowledge that they have received it. Step 1 – In order to write the lease termination the original rental agreement should be found to find the date at which it was signed and when payment date. Step 2 – Enter the name(s) of the tenant(s) in the first (1st) line followed by the address of the tenant in the second (2nd). Step 3 – On the third (3rd) line enter the name of the complex (if any) including the property address. Step 4 – Write the effective date of the notice and date after the next payment date as the form must be sent at least thirty (30) days prior. Step 5 – Depending upon if it is the landlord or tenant that is submitting notice they will need to sign the bottom of the form and date. Step 6 – The form will need to be sent to the other party either through Certified Mail, private service company or by hand. 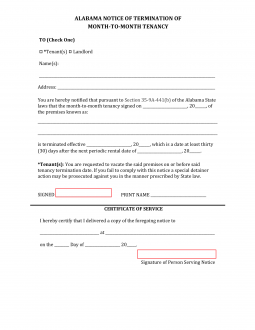 If it is given by hand have the recipient sign the document to verify they have received it.